Charles Darwin knew that making the case for evolution would involve more than just a good idea. . Darwin knew the idea of evolution would fall into disrepute if any aspect of it was questionable. 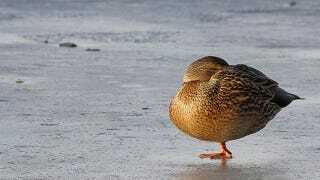 Thankfully, dead duck feet provided the answer to one of evolution's biggest mysteries. The problem was this: Why it was possible to find similar species of animal along the western coast of Europe and the Eastern coast of America? Oceans had proved an impassible barrier for humans for thousands of years, but people in radically different locations spotted animals like squirrels, bears, and mice, that were similar to each other. Occasionally, they even found identical plants or animals on separate coasts. It's understandable that similar environmental conditions might give rise to similar life forms, but Darwin could hardly argue that many identical plants and animals evolved separately by coincidence. He needed an explanation that wasn't "God put them there." And so Darwin embarked on a series of experiments to gauge whether it was plausible that plants and animals could float across oceans. Some of his experiments were tame stuff: he put seeds in salt water for different lengths of time to see if they would still grow into a fruit-bearing plant after weeks, or months, in the water; he floated whole branches in the water to see how long it would take them to get waterlogged and sink or disintegrate; he studied ocean currents and ocean voyage times. Then he got weird. Seeds didn't just float across the ocean — they were carried in the guts of birds. During Darwin's time, bird droppings were recognized as a source of seeds, and plenty of birds migrated long distances. Seed-eating birds crossed some stretches of water, but they tended to chart most of their flight plans over land. Darwin was interested in ocean voyages. Ocean-going birds were more carnivorous than their inland counterparts, but the fish they ate weren't. So Darwin started his own little circle of life. He force-fed seeds to fish, then force-fed fish to birds like pelicans and storks. Then he watched their droppings, planted the seeds, and waited for the results. One can only imagine his pleasure when many of the much-abused seeds sprouted. The real coup de grâce came when Darwin decided to investigate the movements of freshwater snails. His theory was that young snails would cling to the feet of ducks, which would fly long distances. Snails could theoretically hop their way across a continent, or even an ocean. Why he couldn't use a whole duck for this experiment, I don't know — perhaps he had an aversion to them. At any rate, he opted for two dead duck feet. He paddled them in the water with young snails. Sure enough, the snails climbed aboard. Darwin admitted that these snails could survive shorter journeys than the seeds, some of which were viable after four months in salt water. The baby snails had to remain wet with fresh water wherever the duck traveled. Still, he'd shown that even animals could make the hop from one continent to another... provided they still had their legs hop with.